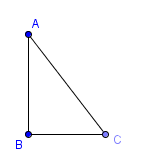 In this construction, we use the Perpendicular Line tool to create right triangle ABC where angle B is the right. First, we construct segment AB, then construct a line perpendicular to segment AB and passing through B. Then, we construct point C on the line, hide the line and connect B to C as well as connect A to C with the segment tool. Figure 1 – Triangle ABC right angled at B. The detailed steps are enumerated below. 1.) Open GeoGebra and select Geometry for the Perspectives menu at the Sidebar. 2.) Click the Segment between Two Points tool and click two distinct places on the Graphics view to construct segment AB. 3.) If the labels of the points are not displayed, click the Move button, right click each point and click Show label from the context menu. 4.) Next, we construct a line parallel perpendicular to segment AB and passing through point B. To do this, select the Perpendicular Line tool, click segment AB, then click point B. 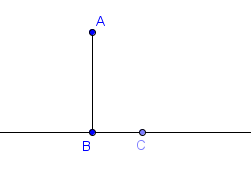 Figure 2 – Line BC perpendicular to segment AB. Bbe sure that you can only drag point C on the line. Otherwise, you have to delete the point and create a new point C. 8.) Next, we hide the line passing through B. To hide the line, right click the line and uncheck Show Object from the context menu. 9.) Select the Segment between Two Points tool and connect B and C. With the same segment tool, connect A and C. 10.) Using the Move tool, drag the vertices of the triangle. What do you observe? 11.) If you want, can use the Angle tool to verify the measure of angle B. To do this, click the Angle tool, and click the vertices of the triangle in the following order: point C, point B and point A.